I was last minute brainstorming for a costume to wear on Halloween night, and came up with this while watching Alice in Wonderland. 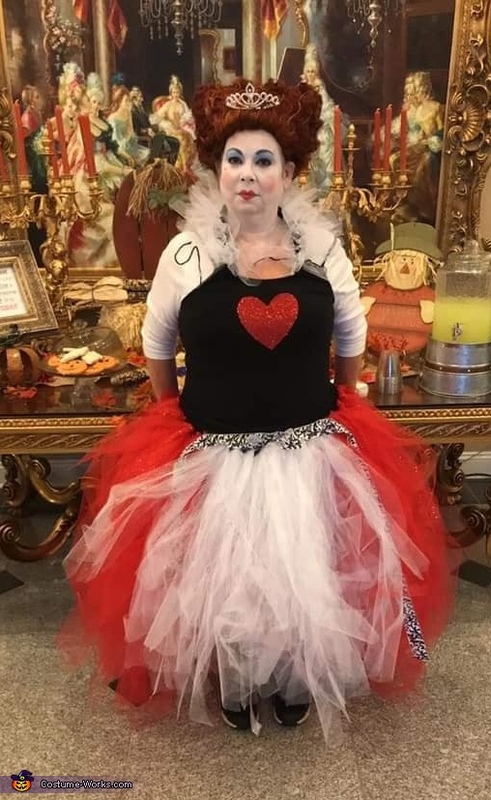 It is a Queen of Hearts costume that I made in about 5 hours (minus doing the makeup)! I wore this for a Halloween contest at a local casino on Halloween, 2018. I placed in the top 10! This costume was super easy to make - it is a tank top that I sewed a crocheted border on the bottom and on each of straps and tied tulle to all of the borders. I did have to purchase the wig, tiara, and makeup to complete the outfit. It was cold and rainy on Halloween where I live so I had to wear a long sleeve shirt under the outfit. I had a lot of fun making this and wearing it - so many people kept coming up to me telling me how great my costume was.